Arcanum Design Solutions is a design and photography agency based in Birmingham. Managing Director Bill Bishop has been in the design business for more than 25 years, working with some of the region’s brightest advertising and design agencies. He formed Arcanum Design Solutions in 2001, and since then has been providing creative, affordable design solutions for his clients. We work for a wide variety of clients, from multinationals to local start-ups. We approach each client and each project with the same ethos: to understand the client’s business needs and goals, and offer an innovative solution. For the last 10 years we have complimented our design expertise with commercial photography. We produce images for organisations across all industry sectors. We usually shoot on location and have worked throughout the UK and Europe, but are equally at home in a studio. We gained our experience of big brands at some of the Midlands’ best Ad Agencies. Now you get Big Agency experience without the Big Agency cost. Bill is a great asset to the business. He is an extremely skilled designer, a regular photographer at our events and a trusted brand champion. His expertise has been a big help in enhancing our brand visualisation and we look forward to working with Bill for many years to come. Bill has supported us with design and photography services for years. Very professional, a nice guy to work with, creative, intelligent and cost effective. Would we recommend Arcanum – without hesitation. 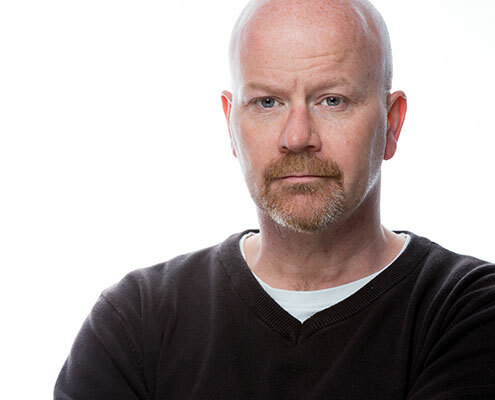 We have used Bill a few times now; for acting headshots and for corporate shoots, at both indoor and outdoor locations. He unobtrusively sets up his equipment and explains in full the format of the shoot, and he constantly checks back to ensure everyone is happy. Bill has the ability to make everyone feel at ease and instinctively knows how to gently prompt the subject of the photographs to gain the best possible shots. The final result is always immensely professional and of the highest quality. I have received several very positive comments about all the photographs and have recommended him many times to others and would not hesitate to do so again. Couch, Perry and Wilkes appointed Arcanum Design following a pitch to design and present a complete new branding package for our organisation. Bill’s creativity, style and modern ideas were well conceived and interpreted our business and its DNA successfully, whilst providing excellent support and appreciation of our requirements during the integration of a complete re-launch of our business’s client facing aspects. The restructuring of our website, branding and artwork created, were integrated and introduced seamlessly and successfully across our nationwide business. We would be very pleased to recommend Arcanum. Whether using design or photography services Bill always delivers over and above. Even with a full brief he takes time to research for himself and always looks at the bigger picture – often adding value to the project by doing so. And, he has an eye for practical detail – a rare quality in an outstanding designer. He is always my first point of call. Bill has supported our thinkSAFE! programme for the last 6 years and is a joy to work with. Clear communication on what is required along with flexibility and creativity as we develop new modules. All timescales have been met – even when they have been truly tight. Bill has always been most professional and a real team player.